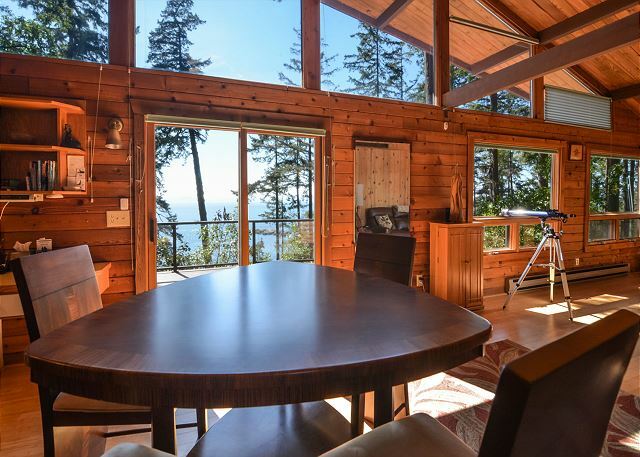 From this beautiful, rustic property you will enjoy views of Haro Strait and Vancouver Island in the distance. You might even sight Orcas from the new waterside deck. What a magical, treehouse-like setting. 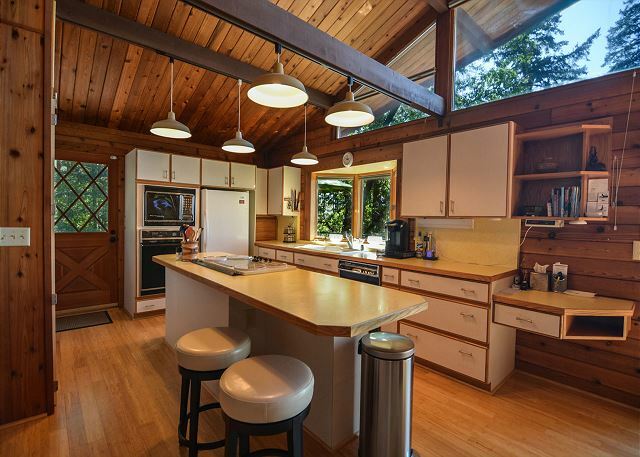 The living room and kitchen are part of a great room that extends the length of the house. A stylish dining table sits midway between the kitchen and living room. The kitchen is of a generous size and well appointed. The living room is rustic and cozy with a corner fireplace. 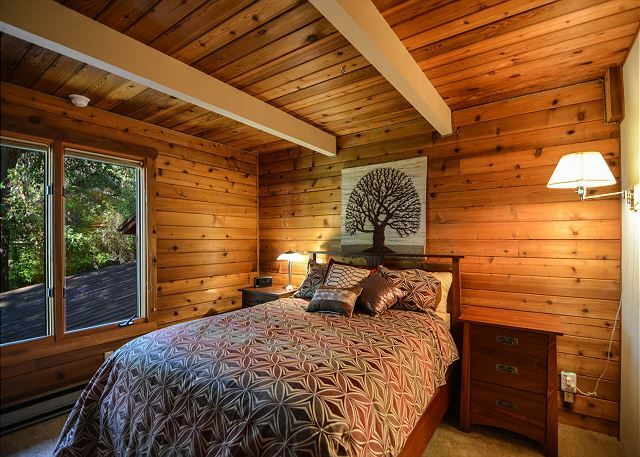 The master bedroom includes a comfortable queen-size bed. Second bedroom with full-size bed. Small room with pull out sofa bed. 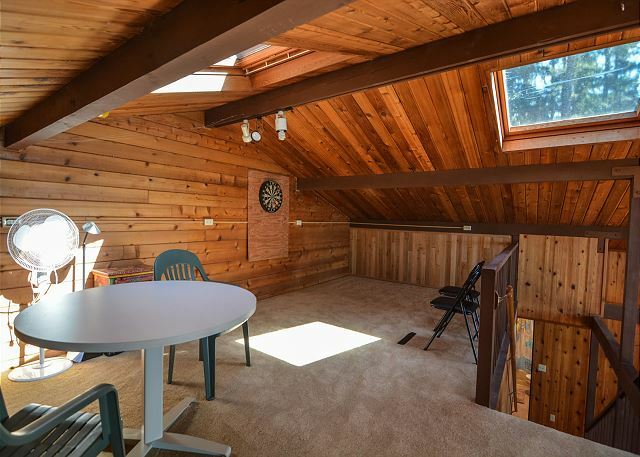 Upstairs game area loft, perfect for family fun. There is a large brand new outdoor deck with beautiful views, a dining table and chairs and a BBQ. Orca Overlook sits perched on a hillside overlooking some of the most Orca traveled waters in Haro Strait and the Salish Sea. 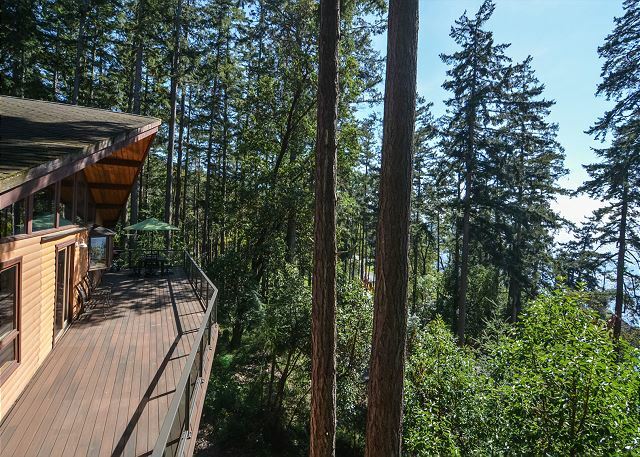 A brand new large deck, surrounded by trees, gives one the feeling of being in a tree house. 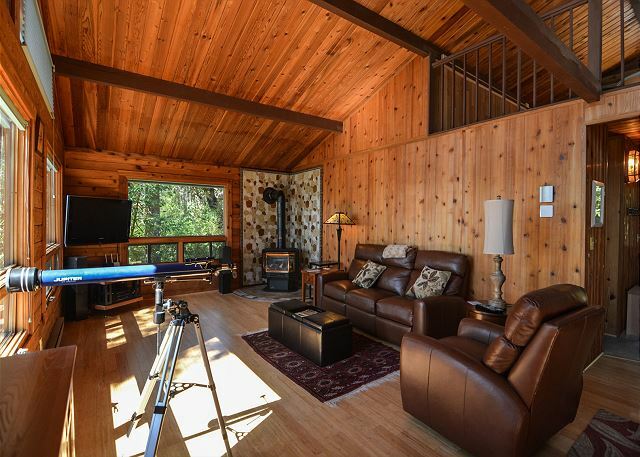 After you watch the sunset over Vancouver Island in the distance, move indoors to the cozy living room to stream Fire TV (no satellite reception). 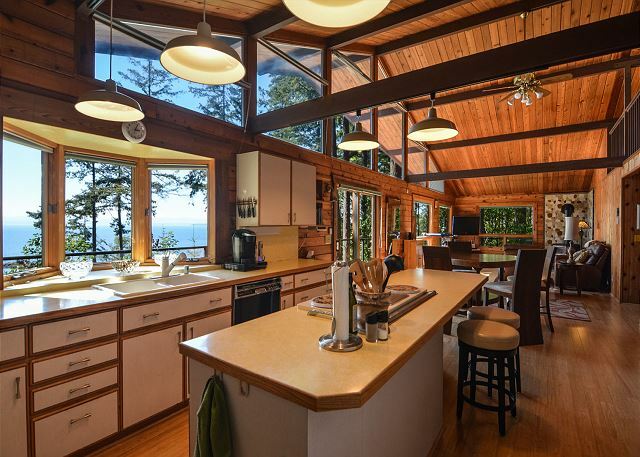 The home features large windows that look out over the sea, so bring your binoculars. The open loft, living room, and kitchen are ideal for enjoying your family vacation together. 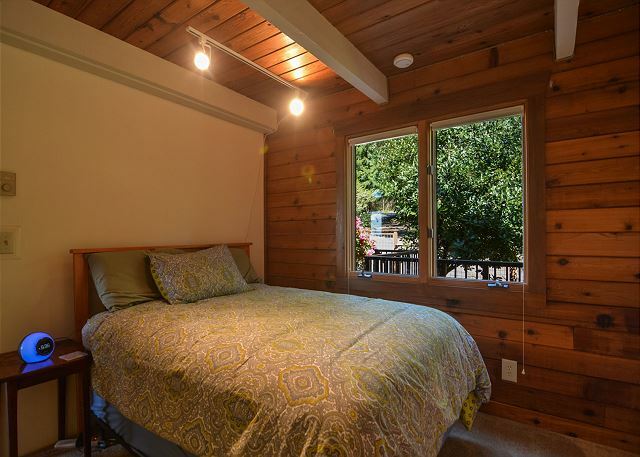 There are two private bedrooms, one with a comfortable queen-size bed and the other with a full-size bed. A third room has a pull-out queen sofa bed. 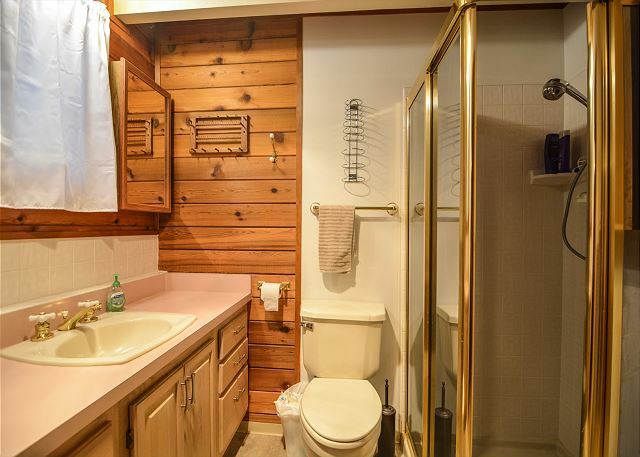 There are also two full bathrooms (one with shower & one with tub) on the main floor. The kids and family will definitely enjoy the loft which is set up to be a game area, complete with a round card table and dart board. Downstairs, the well equipped kitchen is complete with a bar counter and bar stools for staying in touch with whoever is doing the meal preparation. Nearby is a dining table for indoor dinner seating. If it is a nice sunny day you may choose to eat out on the deck where there is additional seating under a beautiful green sun umbrella, where evening sunsets abound. A short walk down the access road leads to a community beach shared by four homes in the area. 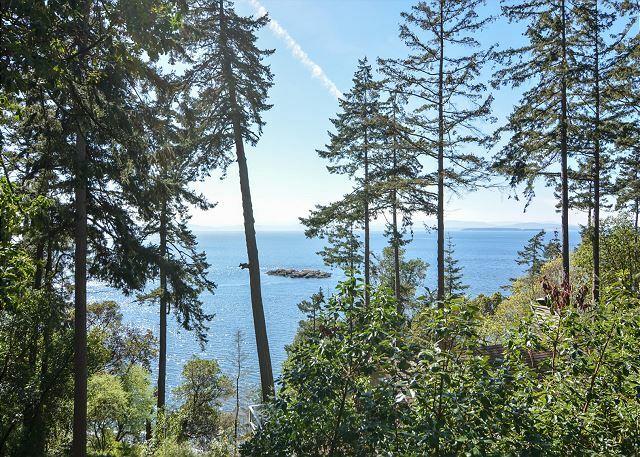 This property is also adjacent to the West Side San Juan Island County park with its beach for launching kayaks and having a picnic. Northwest Island Escapes makes every effort to provide timely maintenance and service for all the amenities listed in this property description. However, at times, due to events out of our control, these services may not be as fast or reliable as our guests are used to on the mainland. Please Read your contract for important additional information about the availability of these services. Our first visit to the San Juans !! This was also our first use of VRBO, and we will do more! House was great, warm and welcoming. Thank you from our two pups, also - they liked the enclosure you’ve made around the yard. Location was fantastyfor us. Had a great time here. Home has a great view and amenities. Great location. Wonderful stay. Beautiful view and place was clean and nicely decorated. Wonderfully stocked kitchen tools and nice BBQ. The only issue was the limited number of TV channels(3). The views were spectacular and ever-changing. Home was beautiful, well appointed and had more than adequate supplies to prep meals. Deck added lovely outdoor space for AM coffee and eve meals. Sofa bed was large and moved to a third bedroom, leaving loft for art and crafts, etc. It is exactly as pictured. Very clean. We wish the fireplace had worked and that there had been more lamp light at nighttime. No noise from county park and its close presence made beach access easy. 10 stars!! We enjoyed Orca Overlook and it was the perfect location for our trip. Our goal was to spend time whale watching. The San Juan county park is close by and we were able to have a wide view of the straight from there. Lime Kiln was also within a few minutes for spectacular sunset pictures. We took quite a few beautiful sunset pictures right off the balcony of Orca Overlook also! There is a good view of Canada, with sparkling lights for maybe Victoria across the strait. 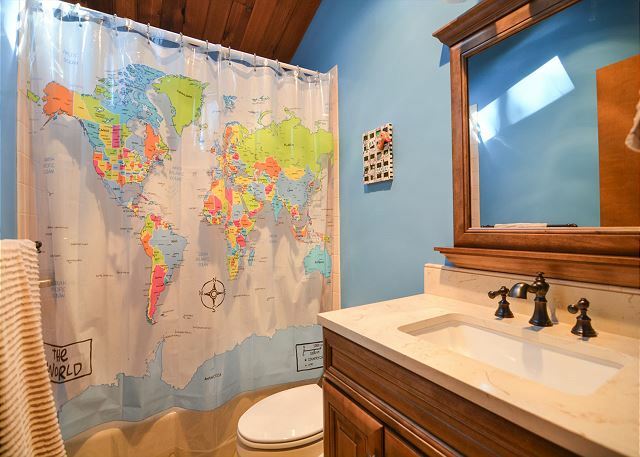 The home had all the amenities and conveniences that we could have asked for. Thanks for the spices and tote bag/ we used it to carry our stuff while we toured the island! Lots of nice touches and very clean. Beds were comfortable and plenty of hot water! Wifi was slow, but usable. Our favorite restaurants were Madrona Bar and Grill, Downriggers and San Juan Island Cheese (really good and unique). San Juan Safaris and San Juan Excursions, both were great whale watching companies - they make every effort to see the whales and we did! Pelindaba Lavender Farm is worth a side trip also! We definitely plan to return! Thanks! 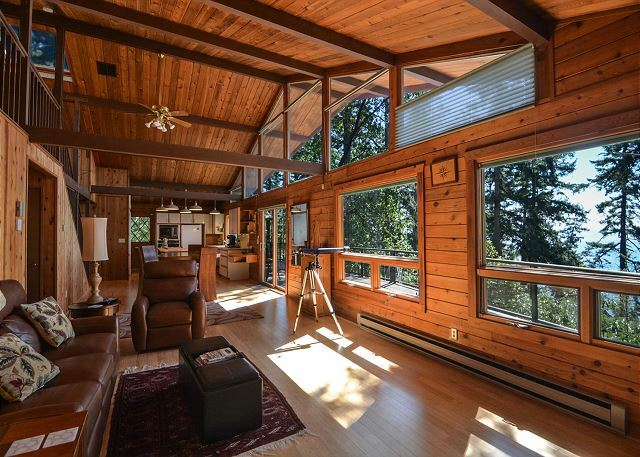 The deck and huge windows looking out into the bay and surrounded by magestic trees make this home the perfect spot to relax. Kitchen has everything you want and need. Linens and beds are comfy and good quality. Gas fireplace is nice, but a little noisy. Would definitely stay again. A great spot to watch the lights of Victoria, passing ships and eagles. The kitchen was so well supplied that we cooked most meals with equipment similar to ours at home. And the home is clean! It felt good and we will return. Lovely spot. 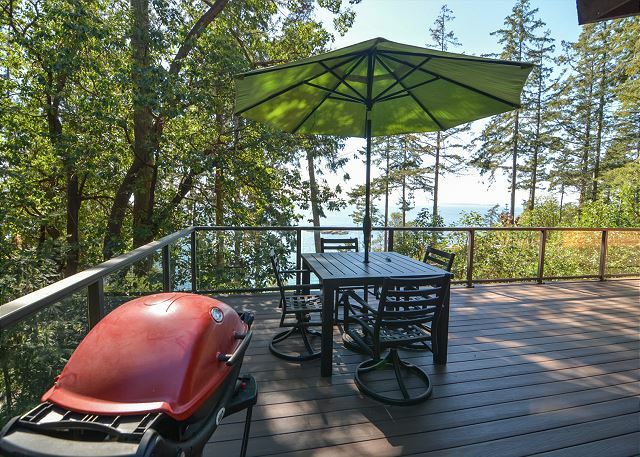 We rented Orca Overlook for a six-night stay on San Juan Island. We had a wonderful vacation here - the views of Haro Strait are amazing (I even saw a whale spout! ), and the house is perfect for an extended stay. The decor is a bit dated (along with the appliances), but you aren't staying here for the decor. The deck is the highlight - we saw some spectacular sunsets while enjoying fresh oysters from Westcott Bay Shellfish (which is just a short drive from the house). We also saw several deer and my husband saw an owl fly overhead. We would definitely stay here again! We had one request for management - we thought that a screen for the sliding door would be great to allow the breezes to come in, without allowing any insects. A very friendly woman from the company stopped over within the hour and installed a screen flap over the door - we were quite impressed with that level of customer service! we stayed for a week. The only real problem we had was the water pressure. It was not real strong and got worse as the week went...shoud have called..guess they were working on the lines. Very nicely stocked kitchen and home. we enjoyed the quiet and the great view form the deck.